“I was chatting with Steve [Hicken - team manager] for a while, and obviously we’ve worked together a lot before. With the new bike coming it’s been a bit different and we had to gather up exactly what was happening,” Dunlop said. “I know Steve and I know Stuart though, as people, and I know they can take a new bike and get it right,” added Dunlop. After a test at the team’s base at Mallory Park on Wednesday, Dunlop will then take part in the annual Pro Test organised by former Honda Britain and Norton team manager Barry Symmons at Cartagena in Spain, which runs from March 1-5, followed by a further test at Almeria. 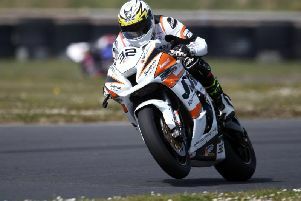 He is also set to take in the opening British Superbike round at Donington Park in April as part of his preparations. Dunlop will also be Suzuki-mounted under his own MD Racing banner for the Superstock class on the GSX-R although he is yet to confirm his choice of machinery for the Supersport races. His first roads outing on the new Suzuki is likely to be at the North West 200 in May. Dunlop will also contest the Southern 100 and the Ulster Grand Prix, where he will renew his rivalry with Honda Racing’s Guy Martin.